When you choose the El Dorado Conference Center for your next meeting or event, you'll discover a facility designed and built to reflect the natural beauty of El Dorado and south Arkansas. You'll find a facility with complete, on-site catering services, state-of-the-art technology and a facility-wide Wi-Fi network. You'll also find a vibrant, beautiful downtown area full of restaurants and specialty shops. The El Dorado Conference center features five breakout rooms which can be joined to accomodate 700 attendees. 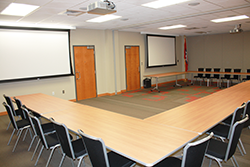 To make your meeting or event a success, your El Dorado Conference Center representative will diligently provide for all of your AV, catering and break-out needs.